Business-driven development is a methodology for developing IT solutions that directly satisfy business requirements. At its core are business processes, which are usually modeled by combining graphical and textual notations. During business-driven development, business process models are taken to the IT level, where they are implemented in a Service-Oriented Architecture. A major challenge in business-driven development is the semantic gap between models captured at the business and the IT level. Model transformations play a major role in bridging this gap. 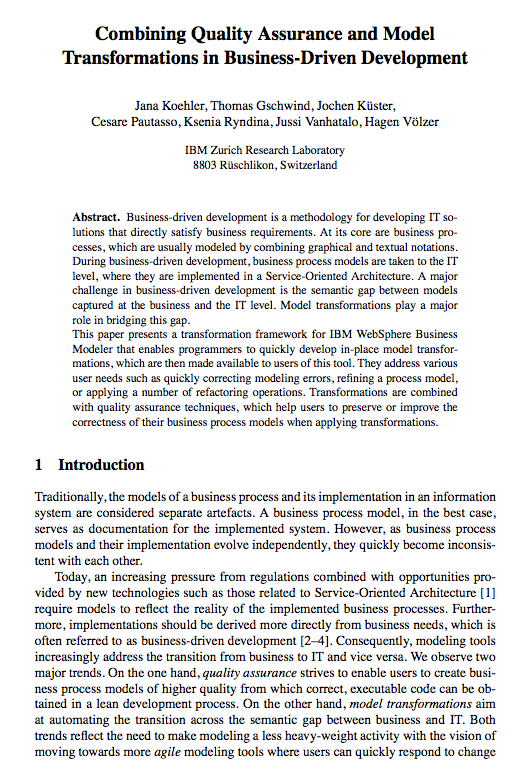 This paper presents a transformation framework for IBM WebSphere Business Modeler that enables programmers to quickly develop in-place model transformations, which are then made available to users of this tool. They address various user needs such as quickly correcting modeling errors, refining a process model, or applying a number of refactoring operations. Transformations are combined with quality assurance techniques, which help users to preserve or improve the correctness of their business process models when applying transformations.